This comfortable and spacious apartment in Barri Gòtic has rooms available to rent in a prime location where the pulse of the city can be felt all around. Sparsely decorated, you can breathe easy even when the city is pushing in: with 5 bedrooms and 4 bathrooms, you will find all the privacy you need when you want it! The apartment in located in a vibrant and historical neighborhood just a few meters off the famous pedestrian mall La Rambla. The area bustles with tourists and locals and has a youthful, artistic vibe for those who love to be at the center of the action. Whether you enjoy people watching, meeting local characters in offbeat clubs or shopping in organic markets, this is the place to be. Utility limit (water, gas, electricity): €50 per month (tenant to pay excess). 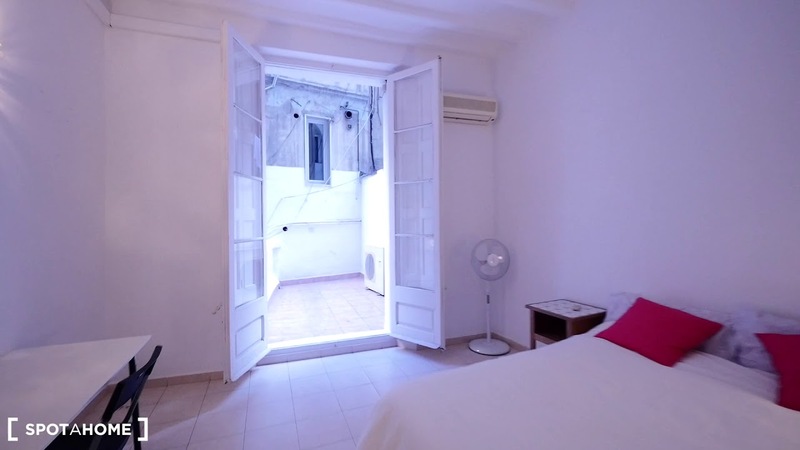 This property can also be rented as entire property €2950 * The apartment is nearby the Rambla! * Some of the bedrooms have private bathrooms. * The property is stylish and sunny. * You'll be living in the Barri Gòtic, Barcelona's most central and historic neighborhood. Incredible. The landlord does not allow parties in this property and asks you to be respectful towards your neighbours. Price shown is for one person. Price for 2 people +€120/month. Bedroom 3 has a double bed and a desk, as well as a chest of drawers.